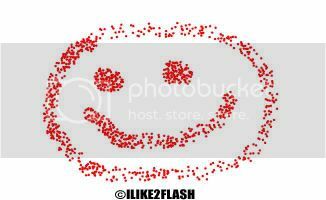 In Flash CS4 there is a new tool called the ‘Spray brush tool’ and like name suggest it sprays graffiti style airbrush effects. You can also load up your own symbols from the library panel, and spray the symbols on stage. The spray brush tool works in the same way as the regular brush tool. You click and move your mouse to the get the spray effect. Below I will discuss how to use the Spray brush tool in CS4. First, you have to select the spray brush tool. 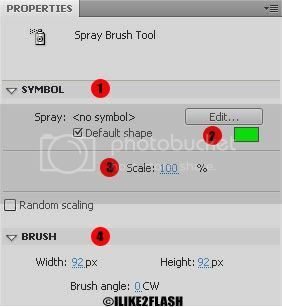 It can be found in the same location as the brush tool shown below. 1. Don’t worry about the Symbol section this will be discussed in the spraying symbols article. 2. You can change the spray colour to whatever you wish. 3. The scale specifies how large the overall spray will be. The default is 100%, and the maximum is 40000%. 4. This is the brush section: The width and height determines how large a spray per click the tool will produce. The default values are 92 x 92 pixels. You can change this to whatever you wish. The brush angle determines the angle that the spray tool will spray. Have some fun experimenting with the new spray tool.